The Type 2 diabetes research collaboration with Novo Nordisk provides important validation for e-therapeutics and its proprietary Network-Driven Drug Discovery (NDD) platform. It is the first commercial deal to arise from the extensive business development efforts, and its significance extends beyond the undisclosed deal economics. It marks the first exploitation of the NDD platform in metabolic disease, with the world leader in diabetes, providing valuable external endorsement and de-risking of the platform. It may also catalyse further near-term deals with large pharma players; multiple discussions are known to be underway with various potential partners, across a spectrum of disease areas. Our valuation is £57.8m or 21.9p/share. Execution of first commercial deal The deal is structured as an initial 12-month research collaboration, under which e-therapeutics’s NDD platform will be applied in the discovery of potentially novel biological mechanisms and therapeutic approaches for a specific area of Type-2 diabetes. Novo Nordisk also has the option to license IP generated under the collaboration; any such license would require mutual agreement of commercial terms. Financial details have not been disclosed. Further evidence of NDD platform versatility The NDD platform has previously generated encouraging data in multiple complex disease areas, including immuno-oncology (with in-house assets targeting tryptophan catabolism and immune checkpoint inhibition), fibrosis, and most recently Parkinson’s disease. This first foray into metabolic disease, supported by the unrivalled expertise and know-how of Novo Nordisk, underlines the platform’s versatility, flexibility, and applicability to diverse and commercially important disease areas. The first of many deals e-therapeutics global business development activities for NDD-based programmes and projects have been extensive, involving detailed discussions with several potential large biopharma partners (including with over half of the top 25 global players). Several conversations are ongoing, in various disease areas. A deal with a company of Novo Nordisk’s calibre should be a precursor for further deals, potentially larger in size and scope. The decision-making process at large pharma can be protracted, but competitive tension may add impetus. 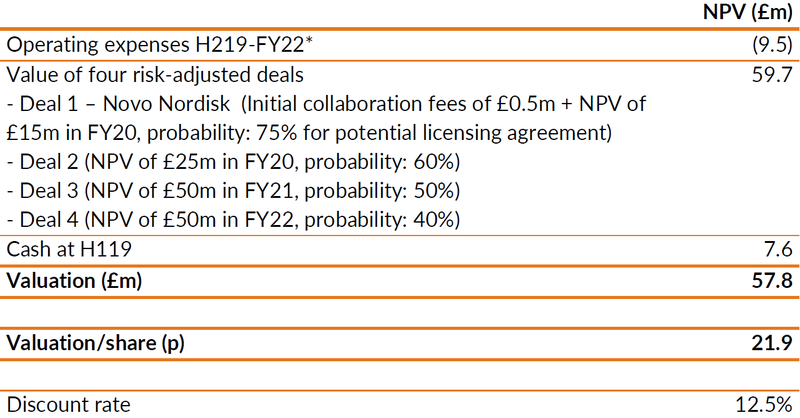 Valuation upgrade to 21.9p Financial terms are undisclosed, so we have updated our forecasts and valuation with assumptions broadly based on similar early-stage research collaborations disclosed by other companies. Upside would come from progression of the Novo Nordisk collaboration into a licensing agreement, and from new deals with large pharma or other partners. 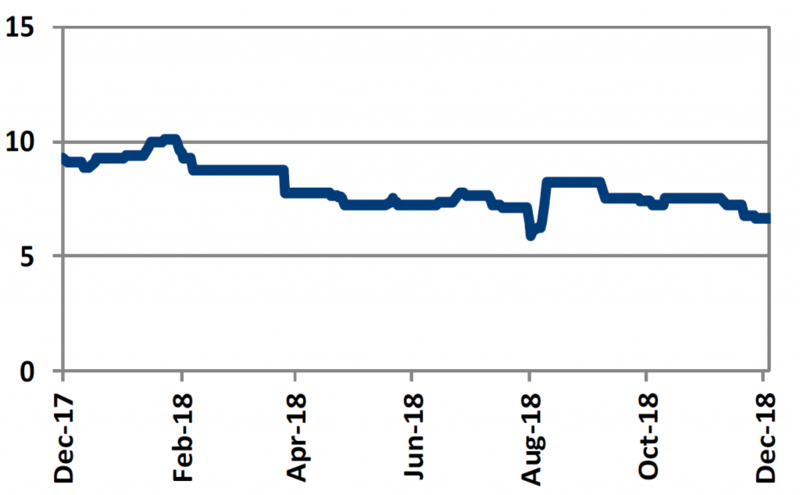 End-July 2018 cash of £7.6m continues to be sufficient to operate into 2020 (FY21). Our valuation is upgraded to £57.8m (21.9p/share) up from £53.8m (20.4p/share). e-therapeutics collaboration with Novo Nordisk is its first commercial deal since the 2017 strategic review prioritised business development. The review focused business development on three core areas: commercial collaborations and licensing in high value areas; out-licensing of in-house NDD-derived assets; and NDD platform enhancements. Early successes fell into the last category, with the Intelligens (neural networks) and Biorelate (natural language processing) partnerships, although this, the first commercial deal, is far more significant. Novo Nordisk is a global leader in diabetes, with a commercial diabetes franchise (including long-acting insulin and GLP-1 products) that represents c80% of its total sales ($7.4bn in FY17). It has a current pipeline of four diabetes programmes and a commitment to innovation, which is where e-therapeutics fits in. While this collaboration marks the first application of the NDD platform to metabolic disease (specifically Type 2 diabetes), the expertise and know-how that Novo Nordisk brings to the partnership means there is likely a greater probability of success. Attracting and also securing a partner of this calibre should bring several benefits to e-therapeutics, not least in providing important external validation and confidence in the versatility of the NDD platform. It provides further assurance that NDD can be broadly applied to multiple biologically complex diseases, which are often, like Type 2 diabetes, highly commercially relevant given their prevalence, growing incidence, and continued unmet medical need. This deal may provide further impetus to ongoing business development discussions across various disease areas. At H119 results, management confirmed that it was in detailed discussions with many potential large biopharma partners for NDD-based programmes and projects, having had in-depth discussions with over half of the top 25 biopharmaceutical companies. Notably, the company has also been shortlisted as preferred partner by a number of these as part of their AI/machine learning/in silico technology selection exercises, as more companies look to use the various technologies to bolster their productivity. To access e-therapeutics’ proprietary data or novel compounds in sought after areas of disease biology. We anticipate that the Novo Nordisk collaboration will pave the way for further commercial deals, which may have the potential to be larger in size, timeframe, and scope. Decision making at large pharma can be protracted, especially when it relates to novel technology; thus the Novo Nordisk deal could be viewed as an important de-risking step which acts as a precursor to subsequent transactions. There is limited disclosure about the structure and economics terms of the Novo Nordisk collaboration, hence we have had to make assumptions regarding this in our financial and valuation models. These assumptions are based on precedent in similar early-stage research collaborations that other companies have secured (eg Vernalis/Ligand). We assume that e-therapeutics is reimbursed for work it carries out under the initial 12-month collaboration period (potential revenue of £500k with no associated COGS), at the end of which, mutually agreeable licensing terms will need to be negotiated to allow Novo Nordisk to commercially exploit any of the associated IP and know-how. We would anticipate that this license would be structured with an upfront payment and payments based on achievement of development milestones. We have updated our DCF-based valuation model of e-therapeutics to take into account the deal with Novo Nordisk and increased likelihood of further deals. Following our review, we have increased our valuation of the company by £4.0m to £57.8m, equivalent to 1.5p per share to 21.9p per share. 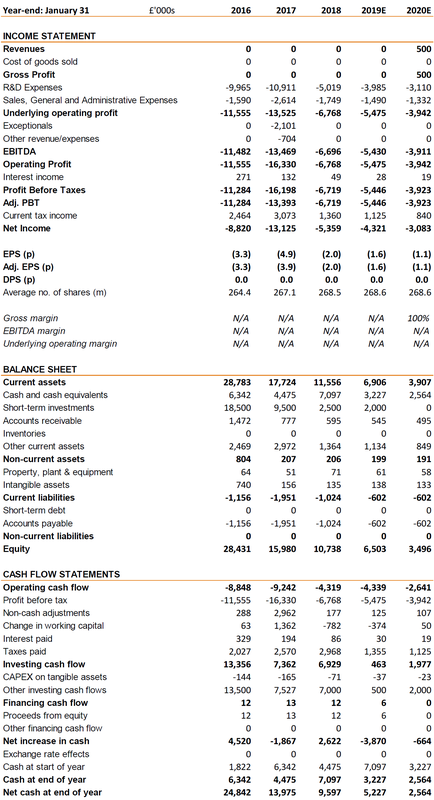 Details of our revised valuation are shown in Exhibit 1.